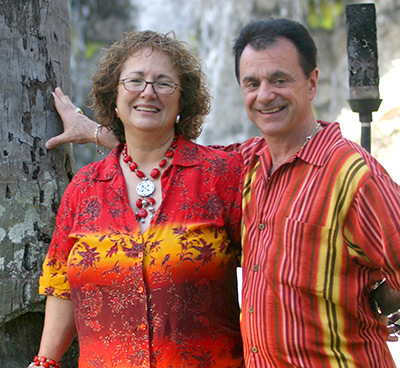 In business together for more than 30 years, Angelo and Claudia Nardone are very successful entrepreneurs, and have become experts in the areas of business communication, personal integrity and perseverance. They have built a very successful marketing business, starting first in their local area of Virginia, Washington DC, and Maryland, and today spanning the globe. Of all the rewards their business has given them, more than anything they appreciate the flexibility to be with their children while they were growing up. Angelo and Claudia made sure their home, in a suburb of Washington, DC, was a haven for themselves and for their children, Sonny, Natalie, and Nick. Angelo was raised in an Italian family in southern New Jersey. After graduating high school he joined the Navy and then attended college through the GI Bill. Claudia grew up in a small town in Maine. A few years after graduating high school she accepted a job at the Pentagon and moved to Washington DC where she met Angelo. Angelo pursued his masters degree in special education from American University, and became a teacher and therapist at a mental health center in the DC area, working first with Down’s Syndrome children and later with kids who were emotionally disturbed. Through a friend, Angelo was introduced to an opportunity to start his own business; both he and Claudia worked full-time during the day, while launching their business part-time in the evenings. Once Angelo’s part-time income exceeded his full-time income, he turned down a promotion as the facility director in order to devote himself to their dream of having their own business. They have focused full-time on their business ever since. The Nardones have supported Easter Seals since 1983. They have raised millions of dollars and contribute their time and energy to support Easter Seals services that touch the lives of children, adults with disabilities, returning veterans and their families. Angelo says that “it’s a big part of what we do, and we’re very proud of it.” Claudia adds, “Once you know in your heart that your small effort can really make a difference to someone, you can’t help getting involved.” In 2011, for their exemplary generosity and altruism, they were presented Easter Seals New York’s highest honor, the Lilli and Allan Shedlin Award. Angelo and Claudia believe that your passion is your purpose, and have followed their passion of empowering others to realize their dreams and to succeed in life.